This free event is open to the public with free parking as well. "The Lamplighter Guild is a choreographic platform that invites an encounter with God's divine power, fueled by an intimate knowledge of His Word, and galvanized by His promises, whereby students can engage in a partnership with His divine nature." Join Lamplighter for our annual summer concert, featuring the Gray Havens! The Lamplighter Guild is excited to present the Gray Havens, who will be joining us as the featured music artists at the 2018 Guild. Known for their richly textured compositions and narrative songwriting, The Gray Havens will be performing in concert at 7:00 pm on July 11. 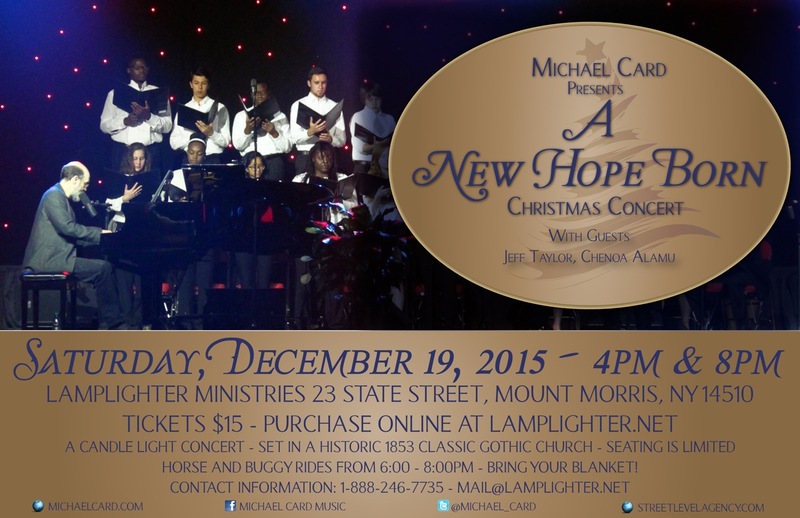 The concert will be held at the Lamplighter Headquarters in Mount Morris, NY. This event will be free for all registered Guild students. However, 50 tickets are also available for anyone who would just like to come to the concert. We anticipate that these tickets will sell out quickly, so don't wait to reserve your seats. Lamplighter Ministries will be hosting a musical event at our campus in Mt. Morris. The concert will be held indoors, from 7:00 pm to 8:30 pm on July 11. Doors open at 6:30 pm. Tickets are limited to the first 50 registrants, and there is no discount for children. Tickets are $25. Sunday, December 9th, 2018, at the historic Lamplighter Ministries campus in Mount Morris, New York. Ticket Price: $10/person or $20/family. A 4 Cellos Christmas is part of the Buffalo Cello Project which is a recently formed group of professionals who are passionate about exploring the growing repertoire for cello chamber music. It is from the delight of performing together that BCP was founded, sharing original music and creative arrangements of masterworks from the Renaissance, American Song Book, Tangoes, classical themes, and Broadway. The Buffalo Cello Project quartet members have performed in many international music centers, played under some of the most acclaimed conductors, taught at colleges and universities throughout the Western New York region and beyond, and studied with some of the most important cellists of our time. Join us for this special afternoon performance at the Lamplighter Auditorium, a beautiful 1800s Episcopalian gothic church. Come early or stay late as we open our bookstore with special pricing. Lamplighter books and dramatic audios are stories that redeem hearts and build Christlike character. Our mission is to make ready a people prepared for the Lord. This is an exciting time! We will be recording our 24th and 25th Audio Dramas. My Golden Ship and Quicksand: Getting to the Bottom are sure to be among our best audio dramas.